Let’s first remember that all of the products and ingredients that touch our skin enter our blood stream. Now let’s take a moment to grab the bottle of soap at your sink and look at the ingredient list (if there is one). How many of those ingredients can you pronounce? Probably not many, I can’t either! Antibacterial hand soap has become the most popular soap on the market and we’ve all been made to believe we need it. But, the truth is we don’t! The active ingredient in most anti-bacterial soap is Triclosan. If you do a quick Google search you’ll find out Triclosan is a pesticide! WHAT? A pesticide? Do we really want to put pesticides on our skin multiple times a day knowing that it’s getting into our blood stream? NO! Continue farther down the list of ingredients and you’re bound to see many synthetic chemicals and artificial colors. A simple wash with soap and water is all we need to get rid of germs, actually, antibacterial hand soap has been known to kill bad and good bacteria, resulting in more sickness! We need the good bacteria to fight the bad! So, let’s get back to the basics! This recipe is so simple and quick to make. I hope you love it as much as we do! That’s it! You’re done! You’ll be SO happy with this soap and how simple and fast you can make it! The Dr. Bronner’s comes in 16-32oz bottles, so you’ll be able to make many, many batches of this soap. 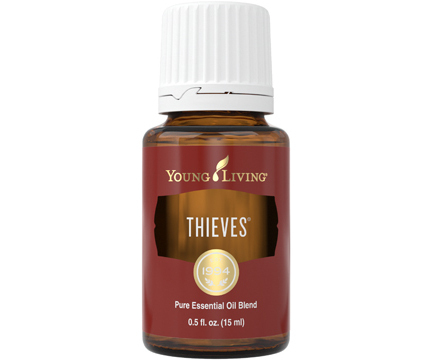 And one 15ml bottle of Thieves essential oil has roughly 240 drops, giving you about 24 bottles of soap (if you’re not using your Thieves oil for other purposes). A side note: My family uses this same recipe for body wash as well, but instead of Thieves essential oil we use 10 drops of Gentle Baby, Tea Tree, Patchouli, Orange or other fresh smelling essential oil. We even make our own baby head–to–toe wash using this recipe. Lavender or Sleepize essential oils are great for baby’s night time bath wash. If you don’t know anything about essential oils feel free to contact me for some education or go here.